Images of Nature is a new permanent gallery showcasing the Museum's world-famous collection of natural history artworks. Prints, watercolours and paintings from eminent natural history artists such as the prolific bird illustrator, John Gerrard Keulemans and accomplished botanical artist, Georg Ehret, feature in the collection. Alongside this historic body of work are modern images created by scientists, imaging specialists, photographers and micro-CT scanners. Highlights among these are tiny, intriguing scientific images of stained-glass-like meteorite slices and a 3D scan of a shark head. 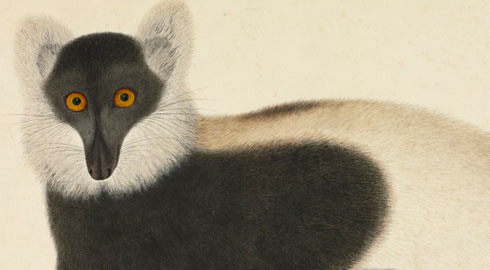 Zoological drawings, including this ruffed lemur, from the 19th-century Chinese Reeves Collection feature in the Images of Nature gallery's first temporary exhibition.